Inspired by Ronlit’s recent post It’s back!, and with the first frost of the year the other night, we thought it was time for a maintenance check on our fauna nest-boxes, and an inspection for any occupants. 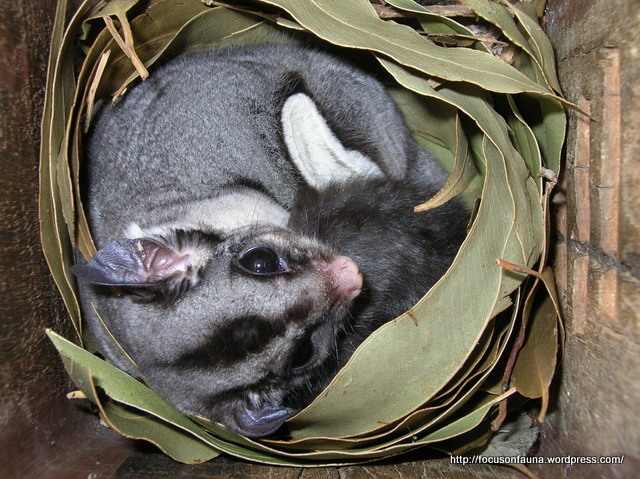 This proved to be a rewarding experience – of the 13 boxes we have installed, 6 were occupied by Sugar Gliders (Petaurus breviceps) and a seventh had a well-constructed Brush-tailed Phascogale (Phascogale tapoatafa) nest of shredded-bark with lots of fresh scats (droppings) and a strong smell, so probably had a phascogale in residence. The boxes are of various designs with different sizes, shapes and entrance-hole location and diameter. The Sugar Gliders don’t seem to be too fussy, as long as there is a warm dry space inside. However, if you are considering installing nest-boxes, it pays to do it right. There is some really good information on nest-boxes in a pamphlet available from the Strathbogie Ranges-Nature View website as a pdf download called Nest-box Know-how which was developed from a forum at Violet Town last year . The occupied boxes are shown below with their corresponding occupants. Several of the boxes, some made by Rotary, were donated following the Black Saturday fires. Sugar Glider and remains of former rosella occupant – who needs leaves? Obviously Ron Litjen’s Powerful Owl hasn’t visited your area recently! Fantastic! … and interesting observations.